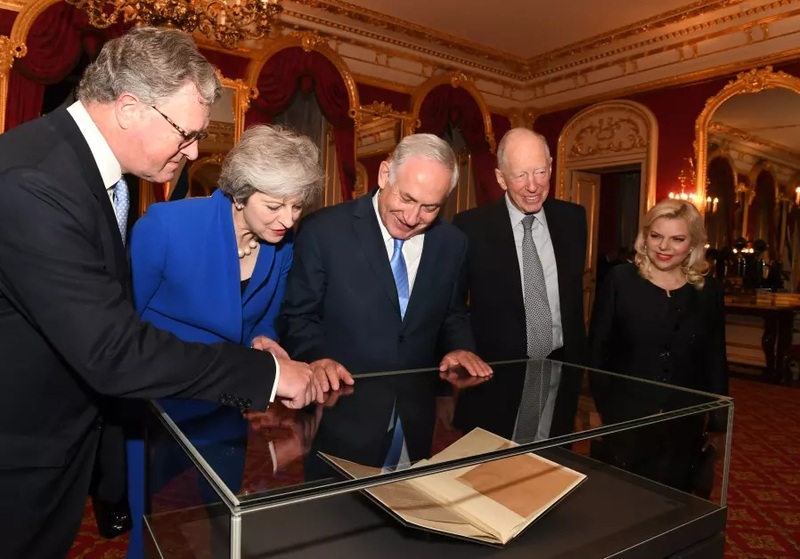 British prime minister Theresa May views the Balfour Declaration with the Israeli prime minister, Benjamin Netanyahu and Jacob Rothschild at his house. The Balfour Declaration, which is the birth certificate for the Zionist state, was actually a letter written to Lord Rothschild in 1917. The letter stated Britain's support for a Zionist state in Palestine, which was in effect one party (UK) giving to a second party (Rothschild Zionists) the land of a third party (i.e. Palestine, Palestinians). What the UK got out of the deal was a promise by the Rothschilds to use their considerable power in the USA to influence Americans to join the battle that was to become known as World War I. The sinking of the Luisitania did the trick. The Rothschilds had more money than governments and didn't want it confiscated, they needed a safe haven to protect their wealth. The Rockefellers and Rothschild Zionists set up their "Federal" Reserve in 1913 along with their criminal collection agency the IRS. The Balfour Declaration of 1917 showing the intent to make a "Jewish" state in Palestine, against the Torah, then the Rothschild and Rockefeller families create the UN and about 1947 take over Palestine using their alliance with the British and the UN; Party A (Britain) gives Party B's property (Palestine) to Party C (Rothscild's Zionist Israel). Sounds legit to me. The Balfour Declaration was a sham. Britain did not possess Palestine and had no right whatsoever to promise Zionism a place in Palestine. Palestine at the time was controlled and effectively owned by Ottoman Turkey. The Balfour Declaration did allow Zionism to say that its claim to Palestine had been recognized by a major power, and then to assert that the Zionist enterprise was therefore a legitimate one. But the legitimacy Britain conveyed by implication was entirely spurious, meaning not genuine, false, a sham. The Balfour Declaration was dated November 2, 1917 (See:http://commons.wikimedia.org/.../File:Balfour_declaration...), and the British-led Egyptian Expeditionary Force, commanded by Edmund Allenby, captured Jerusalem on 9 December 1917 and occupied the whole of the Levant following the defeat of Turkish forces in Palestine at the Battle of Megiddo in September 1918 and the capitulation of Turkey on 31 October. The Balfour Declaration was a sham. For 100 years the British statement, which inaugurated Zionism’s legitimation in the eyes of the world, has been seen as the isolated act of a single nation. The truth is much different. British Lord Arthur Balfour in Jerusalem in 1925. Topical Press Agency/Hulton Archive/Getty Images. Martin Kramer teaches Middle Eastern history at Shalem College in Jerusalem and is the Koret visiting fellow at the Washington Institute for Near East Policy. His most recent book is The War on Error (2016). At the time, as World War I raged, British and Australian forces were fighting deep in Palestine against the Ottomans, and were poised to take Jerusalem. The Balfour Declaration, for all its vagaries, constituted the first step toward the objective of political Zionism as outlined by the First Zionist Congress at its meeting in Basle, Switzerland in 1897: “Zionism seeks to establish a home for the Jewish people in Palestine secured under public law.” Theodor Herzl had failed to land such a commitment, either from the Ottoman sultan or from any of Europe’s potentates. The declaration was the much-awaited opening: narrow, conditional, hedged, but an opening all the same. “There is a British proverb about the camel and the tent,” said the British Zionist leader Chaim Weizmann later that November. “At first the camel sticks one leg in the tent, and eventually it slips into it. This must be our policy.” And so it became. Since the Balfour Declaration constitutes the beginning of Israel’s legitimation by other nations, the declaration’s own legitimacy has been the subject of unending attacks. This is made easier with each passing year, as the world that produced the declaration draws ever more remote. Few people today are sure why World War I was fought at all, and Britain circa 1917 is best known through PBS costume dramas along the lines of Downton Abbey. The Balfour Declaration? In the mind’s eye, one imagines back-and-forth negotiations in the palaces of Whitehall and the gilded drawing rooms of the Rothschild dynasty, with white-gloved servants delivering urgent sealed missives. Surely the declaration was stirred by similarly antique passions and interests, from safeguarding England’s route to India to satisfying the Christian Restorationist imperative of returning the Jews to the Holy Land. And so indeed it has largely been taken. The declaration has come to be remembered as either the moment of conception for Israel (and what the pro-Zionist parliamentarian Richard Crossman called “one of the greatest acts of Western statesmanship in the 20th century”) or the original sin against the Palestinian Arabs (and what the Palestinian scholar-activist Walid Khalidi recently called “the single most destructive political document on the Middle East in the 20th century”). In this sense, the declaration’s centennial is truly “a big deal.” According to various announcements, come November, it will be celebrated by Israel, protested by the Palestinians, and “marked” by Britain. Few of the celebrants or the protesters, however, will have much understanding of what produced the Balfour Declaration—which should not be surprising. Even historians cannot agree, which assures that almost no one who hasn’t studied the history of it is likely to have a clue. The various views of Britain’s motives need only be summarized here. In 1916 and 1917, the Allied powers (Britain, France, Belgium, Russia, Italy, and later the United States) were locked in a devastating war with the Central powers (Germany, Austria-Hungary, Bulgaria, and the Ottoman Empire) and fearful that they might be fought to a draw. Hence the most documented explanation for the declaration is that the British government hoped to persuade Jews in two wavering Allied countries, the United States and Russia, to insist that their governments stay in the war until total victory. Jewish influence, the British thought, would tilt the debate in Washington and St. Petersburg and could best be activated by the promise of a Jewish restoration to Palestine. This was married to a (misplaced) fear that Germany might steal a march on the Allies by issuing its own pro-Zionist declaration. That legend finds its crudest and its stupidest expression in the Protocols of the Elders of Zion [wrote Sacher], but many even of those who reject a forgery and a lie have a residual belief in the power and the unity of Jewry. We suffer for it, but it is not wholly without its compensations. It is one of the imponderabilia of politics, and it plays, consciously or unconsciously, its part in the calculations and the decisions of statesmen. The second explanation is that the British rushed to embrace Zionism as a means of justifying their own claim to Palestine in the anticipated postwar carve-up of the Middle East. The British, as patrons of the Jews, could exclude their French ally from Palestine while claiming to champion the “self-determination” of a small people. While this explanation differs from the first, it shares with it a straightforward assumption: needing Zionism for their own ends, the British required very little prodding to produce the Balfour Declaration. But in the collective memory of Zionists and Israelis, there is another factor: the persuasive genius of one man, Chaim Weizmann. That telling goes like this: Weizmann, famed biochemist and later head of the English Zionist Federation, managed single-handedly to win over Britain’s leading politicians and opinion-makers to the Zionist idea. The Weizmann saga unfolds behind the scenes in London drawing rooms, where this Russian Jewish immigrant, having arrived in England only in 1904, succeeds in persuading—some might say, seducing—the likes of Balfour, Mark Sykes, Alfred Milner, and David Lloyd George, who would soon hold the fate of the Middle East in their hands. The Balfour Declaration is the triumph of one man’s indefatigable will, and his personal effect upon a handful of British statesmen. The declaration is the personal achievement of one man alone: Dr. Chaim Weizmann. Four years of patient and calculated work established the link between us and each one of the statesmen in this country. The important people of England speak openly of his personal charm as one of the most effective factors in Zionist propaganda in England. The endorsement of Zionism by most of the Rothschilds in London is also due to his influence. . . . In our history, the declaration will remain linked to the name of Weizmann. In the decades that followed the Balfour Declaration, Weizmann would go on to a famed career as a leader, spokesman, and diplomat of Zionism, culminating in his election as Israel’s first president. In 1949, he published his autobiography, Trial and Error, translated over the next two years into Hebrew, German, Dutch, Swedish, Norwegian, Spanish, Italian, and a few years later French. This work firmly cemented his place in the Zionist pantheon as the man who brought forth the declaration. He died in 1952; when, in 1967, Israel celebrated the 50th anniversary of the Balfour Declaration, it issued two stamps, one depicting Balfour, the other, Weizmann. When the fuller story is told, the Balfour Declaration looks very different. It is no longer a British imperial grab but the outcome of a carefully constructed consensus of the leading democracies of the day. Who were these “additional partners”? Their contribution has been largely forgotten. But when the fuller story is told, the Balfour Declaration looks very different. It is no longer a British imperial grab but the outcome of a carefully constructed consensus of the leading democracies of the day. It is no longer in tension with the principle of self-determination, but a statement made possible by the very champion of the principle. And it is no longer an emanation of secret dealings but one of the first instances of public diplomacy. It is, in short, not a throwback to the 19th century but an opening to the 20th. The key to understanding the fuller story is this: in regard to Palestine, Britain could not have acted alone, because it belonged to an alliance. The Allied powers, especially Britain and France but also Russia, Italy, and later America, were fighting together. Their policies had to be coordinated. It would have been unthinkable for Britain to have issued a public pledge regarding the future of territory yet to be taken in war without the prior assent of its wartime allies—especially those that also had an interest in Palestine. This fact is entirely obscured by the Balfour Declaration’s form. The letter was written on behalf of His Majesty’s government and no other. The declaration was approved by the British cabinet and no other. It was signed by the British foreign secretary and no other. On the face of it, the declaration was a unilateral British letter of intent. In truth, in expressing a broad consensus of the Allies, it might even be seen as roughly comparable to a UN Security Council resolution today. To appreciate this, it is necessary to shift the focus away from London to Paris, Rome, and Washington; and away from Chaim Weizmann to a Zionist leader now barely remembered: Nahum Sokolow. Nahum Sokolow? Most Israelis know a Sokolow Street—several older Israeli cities have one. Fewer can locate Beit Sokolow, the headquarters of the Israeli Journalists’ Association in Tel Aviv, or know of the biennial Sokolow Prize, a journalism award. Scarcely anyone is aware that Sde Naḥum, a small kibbutz in the Beit She’an valley, is named after him. But as this short list suggests, Sokolow has been almost entirely forgotten. Unlike Weizmann, no institute or memorial bears his name, no currency or stamp bears his image. He is buried on Mount Herzl, where he was reinterred in 1956, two decades after his death. Even then, an Israeli newspaper reported that “those born in Israel and the new immigrants who encountered the funeral processions, asked: ‘Who is this Nahum Sokolow?’” Today, more than 80 years after his death, only a few historians remember Sokolow, and none has troubled to produce a scholarly biography. Who then was he? Nahum Sokolow was born sometime between 1859 and 1861 in central Poland and received a traditional rabbinic schooling. But he taught himself secular subjects and soon gained renown as a prodigy, a polyglot, and a prolific writer on a vast array of subjects. In 1880 he moved to Warsaw and later assumed the editorship of the Hebrew journal Hatsefirah, which became a daily in 1886. There he contributed a popular column and wrote much of the rest of the paper, so that his fame spread with the spread of modern Hebrew. He was soon acknowledged as the world’s most prominent Hebrew-language journalist. In 1897, Sokolow reported from the First Zionist Congress and fell under the spell of Herzl. It was he who translated Herzl’s utopian novel Altneuland into Hebrew and who gave it the Hebrew title Tel Aviv, which a few years later became the name of a new Jewish city. Leaving daily journalism in 1906, he became the secretary general of the World Zionist Organization, which was struggling after the death of Herzl two years earlier. Sokolow is the entry point into the fuller story of the Balfour Declaration. Indeed, at the time of the declaration, many Jews around the world gave him more credit for it than they gave to Weizmann. Sokolow thereupon threw himself into lobbying, diplomacy, and propaganda, traveling across Europe, America, and the Ottoman Empire. In 1911, he was elected to the Zionist Executive; in 1914, following the outbreak of war, he relocated to Britain, where he joined forces with the dynamic young Chaim Weizmann in the campaign to win British recognition for Zionist aims. Sokolow is the entry point into the fuller story of the Balfour Declaration. Indeed, at the time of the declaration, many Jews around the world gave him more credit for it than they gave to Weizmann. This was partly because Sokolow the Hebrew journalist was better known than Weizmann the biochemist. As Herzl’s contemporary, he was also senior to Weizmann in age and in his standing in world Zionism. But Sokolow was also given credit because he accomplished what many thought impossible: during the spring of 1917, he secured the explicit or tacit assent of the French and Italian governments, and even of the Catholic pope, to a Jewish “national home” under British auspices. How did he surprise everyone, including Weizmann, by his achievement? Why has it been forgotten? And how might its recovery benefit the centennial retrospective on the Balfour Declaration? In early 1917, the Zionists had one objective. There was no doubt that the best prospects for Zionism lay in a total Allied victory over the German-backed Ottomans and the placing of Palestine under an exclusively British protectorate. Only in Britain did Zionism have sufficient support in governing circles to overcome deep-seated opposition from critics and doubters across Europe, including among influential Jews opposed to Zionism. And only Britain had the mix of strategic interests, military power, and political will to enforce its writ in Palestine. But the Zionists faced two problems. The first: Britain had already promised to share Palestine with its wartime allies. The second: the Zionists didn’t know it. The Zionists faced two problems. The first: Britain had already promised to share Palestine with its wartime allies. The second: the Zionists didn’t know it. Fortunately for the Zionists, David Lloyd George, who became prime minister at the close of 1916, thought that the Sykes-Picot agreement had given too large a place in Palestine to the French. Britain, after all, would do nearly all of the expected fighting and dying against Ottoman forces in the Sinai and Palestine. So Sykes was tasked with revising the Palestine portion of the Sykes-Picot accord in such a way as to leave Britain with the lion’s share. The French, represented by Picot, resisted, insisting that their own claim to Palestine was at least equal to Britain’s. It was at this moment that Sykes “discovered” Zionism. “It seems at first a strange enough story,” Sokolow later wrote. “A certain Sir Mark appears, he makes some inquiries, and then expresses a wish to meet the Zionist leaders. Finally a meeting actually takes place and discussions are entered upon.” That meeting took place on the morning of February 7, 1917, at a private home in London. Sykes there met the foremost leaders and sympathizers of the Zionist movement: Sokolow, Weizmann, Lord Walter Rothschild, James de Rothschild, and Herbert Samuel. From the record of that meeting, it is clear that Sykes held out the prospect that Britain might grant the Zionists some form of recognition—on condition. “France,” he told them, “was the serious difficulty. . . . The French wanted all Syria and [a] great say in Palestine.” Sykes proposed that the Zionists approach Picot in order to “put the Jewish views” before him and “convince” the French. Some of the Zionists in the room resisted the idea, arguing that Britain should do the work, but Sykes thought otherwise. James de Rothschild finally replied that Sokolow was “the proper person” who could “speak for the Russian Jews also.” Sykes agreed to introduce Sokolow to Picot the following day. Sokolow was the diplomatist of the Zionist movement, the diplomatist of the school of the Quai d’Orsay [the French foreign ministry]. His handsome appearance, his air of fine breeding, his distinguished manner, his gentle speech, his calculated expression, his cautious action, his well-cut clothes, his monocle, were faithful to a tradition which perhaps is not so highly honored as before the war. . . . Diplomats and ministers felt that he belonged to their club, spoke their language, and was one of themselves. He practiced their art and was entitled to their privileges. And while Sokolow represented no state, Europe’s leaders saw in “this little bent Jew,” still bearing Russian nationality, an authentic spokesman of the Jewish masses of Russia and Poland, who could move them in the desired direction by the power of his words. He seemed to personify what Sacher called “the great Jewish legend,” as a cosmopolitan leader of the “great Jewry” to which Sykes and others attributed a vast, subterranean influence. And so Sokolow went forth—first to engage with Picot in London, then back and forth to Paris, with an unexpected detour to Rome, all in close coordination with Sykes. It was a daunting mission. Sokolow’s task was to persuade the French not just of the feasibility of the Zionist project but also of the virtues of a British protectorate over Palestine. On the face of it, both propositions should have seemed preposterous to the French. Zionism enjoyed little support among French Jews, and the French had already been promised a share of Palestine equal to Britain’s in the Sykes-Picot accord (the details of which Sykes had kept secret from Sokolow and Weizmann). Yet Sokolow managed not only to disarm suspicion of the Zionist program; he even succeeded in extracting statements of support. Most books on the Balfour Declaration do devote a chapter to the story. (Prime instances: Leonard Stein: “Sokolow in Paris and Rome.” Isaiah Friedman: “Achievements in Paris and Rome.” Ronald Sanders: “Sykes and Sokolow in Paris and Rome.” Jonathan Schneer: “Sokolow in France and Italy.”) With a nod of acknowledgment to them all (and apologies for some simplification), here is a quick summation of Sokolow’s achievements. After two preparatory meetings with Picot in London, Sokolow headed for Paris. In two separate rounds of talks (punctuated by a trip to Rome), he thrice met Jules Cambon, secretary-general of the foreign ministry and one of the great French diplomats of the day, and the second time around had an audience with Prime Minister Alexandre Ribot. To Picot in London, Sokolow had expressed an open preference for British protection, and Picot pushed back. So in Paris he instead emphasized the feasibility of the Zionist project and how it animated Jewish opinion in Russia and America. Two leading historians of French policy, Christopher Andrew and A.S. Kanya-Forstner, described this revised approach as “more diplomatic, more conciliatory, and more misleading.” The French expressed a general sympathy for Zionism, but Sokolow then had the bold temerity to ask for it in writing. And he received it. On June 4, 1917, Cambon issued him a letter (on the prime minister’s authority), which not only anticipated the Balfour Declaration but cleared the way for it. The French expressed a general sympathy for Zionism, but Sokolow had the temerity to ask for it in writing. And he received it. 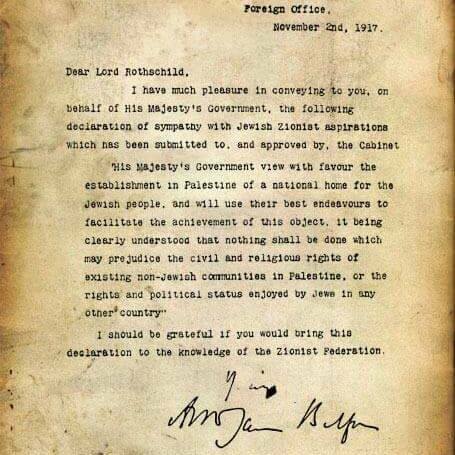 On June 4, 1917, they issued him a letter that not only anticipated the Balfour Declaration but cleared the way for it. You were good enough to present the project to which you are devoting your efforts, which has for its object the development of Jewish colonization in Palestine. You consider that, circumstances permitting, and the independence of the Holy Places being safeguarded on the other hand, it would be a deed of justice and of reparation to assist, by the protection of the Allied Powers, in the renaissance of the Jewish nationality [nationalité juive] in that land from which the people of Israel were exiled so many centuries ago. The French government, which entered this present war to defend a people wrongly attacked, and which continues the struggle to assure the victory of right over might, can but feel sympathy for your cause, the triumph of which is bound up with that of the Allies. I am happy to give you herewith such assurance. As Weizmann’s biographer Jehuda Reinharz has noted, the Cambon letter “in content and form was much more favorable to the Zionists than the watered-down formula of the Balfour Declaration” that followed it. The French accepted a rationale in terms of “justice” and “reparation,” and acknowledged the historical Jewish tie to the land. The letter bound Zionism to the cause of all the Allies, and made no reference at all to the rights of non-Jews. “The Quai d’Orsay had been skillfully and decisively outmaneuvered” by Sokolow, according to Andrew and Kanya-Forstner. “The Zionists now had a written assurance of French support. France, however, had neither any assurance of Zionist support nor any prospect of obtaining one.” The French obstacle to a possible British declaration had been neutralized. It was not only the Cambon letter that Sokolow secured during his continental sojourn. “Yes, yes, I believe we shall be good neighbors!” These words, spoken to Sokolow by Pope Benedict XV on May 4, 1917, thoroughly departed from the previous Catholic approach to Zionism. The visit to Rome had been urged upon Sokolow by the French and facilitated by Sykes. They had hoped that he might win over the government of yet another ally, Italy. But the Catholic Church was no smaller prize: it claimed rights to holy places all over Palestine and maintained, as a matter of theology, that the Jews had been dispersed as punishment for their refusal to accept Jesus as messiah. In 1904, Herzl had met with Pope Pius X, who told him in no uncertain terms that “the Jews have not recognized our Lord, therefore we cannot recognize the Jewish people.” “Non possumus”—we cannot. But a crucial portion of the story unfolded not in London but in Washington. For just as Britain would never have moved on Palestine without the prior consent of its European allies, so it would not have acted without the agreement of President Woodrow Wilson. In April 1917, the United States declared war on Germany (although not on the Ottomans), making itself a major player in the anticipated post-war settlement. One more ally had to be persuaded before Britain could move. The American policy establishment was entirely hostile to Zionism: the Zionist idea seemed impractical, and missionary interests opposed it. On the first ask, in September 1917, Wilson had withheld his approval. Only the second time around in mid-October, when Wilson received the proposed text from London, did he change his mind. “I find in my pocket the memorandum you gave me about the Zionist Movement,” he wrote to his trusted foreign-affairs adviser, Col. Edward House. “I am afraid I did not say to you that I concurred in the formula suggested by the other side [Britain]. I do, and would be obliged if you would let them know it.” House did so, discreetly—even Wilson’s secretary of state wasn’t informed. 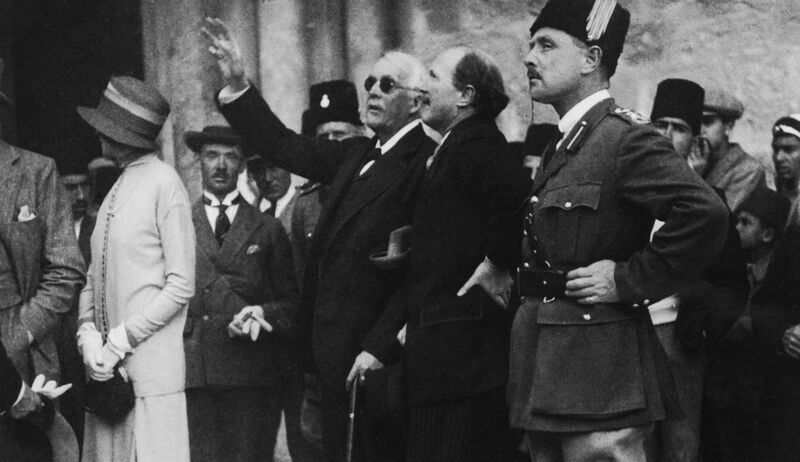 Despite appearances, the Balfour Declaration was more than the chess move of a single power. Behind it stood the Allies, each of whom gave it some push forward. It is not for us to predicate that England has spoken and acted in concert with her Allies, but we are justified in believing that England, ever working in closest cooperation with her Allies in the war, will in the day of peace find herself not only supported by France and Italy, but above all by the American government and people. The British issued the Balfour Declaration on November 2, 1917. But the Zionists understood perfectly well that the Allies would have to be consulted once more on the “day of peace,” and that Palestine as a “national home” for the Jews would be contested. The Balfour Declaration thus opened another chapter, in which the Zionists worked to persuade each Allied government to endorse it openly. Here, too, Sokolow played the lead on the continent, and it was no small task. The French had cooled; America was now well in the war, and Russia (after the Bolshevik Revolution of November 1917) was out, so Jewish opinion in both countries no longer mattered much (assuming it ever had). And there had been a change of government in France since the Cambon letter. In January and February 1918, Sokolow returned to Paris, this time with the aim of securing a public French declaration in support of the Balfour Declaration. There he met with the French foreign minister Stephen Pichon, an old friend, who assured him that nothing had changed in France’s position since the Cambon letter. But Sokolow asked for a formal statement: an explicit French endorsement of the Balfour Declaration. American Jews would appreciate it, Sokolow assured Pichon, and this would help France at the peace conference. So Pichon delivered an endorsement, and it was published on February 10, 1918. Pichon affirmed that “the understanding is complete between the French and British governments concerning the question of a Jewish establishment in Palestine (un établissement juif en Palestine).” Sokolow was not satisfied with this phrase, which fell short of the “national home” (foyer national) mentioned in the Balfour Declaration. So he pleaded with Pichon to use that phrase; on February 14, Pichon sent Sokolow another letter that did just that. Between his secret endorsement in October 1917 and his public one in 1918, Woodrow Wilson introduced a new principle in international relations: self-determination. Between Wilson’s secret endorsement of October 1917 and this public one, Wilson had introduced a new principle in international relations: self-determination. “National aspirations must be respected,” said the president in his “self-determination” speech of February 11, 1918. “Peoples may now be dominated and governed only by their own consent.” From that point onward, critics of the Balfour Declaration would insist that it had denied self-determination to the majority-Arab population. But how could facilitating the Jewish “national home” violate Wilson’s principle, if Wilson himself (as Lloyd George put it) was “fully committed to the Balfour Declaration and was, in fact, an enthusiastic supporter of the project it involved”? Wilson’s endorsement eased any Allied doubt as to whether the Balfour Declaration conformed to the new rule of the international order. The Zionists brought of all these endorsements to the peace conference in Paris in February 1919. Sokolow opened the Zionist presentation at the conference before the foreign ministers of Britain (Balfour), France (Pichon), the United States (Robert Lansing), Italy (Sidney Sonnino), and Japan (Makino Nabuaki). In the era before the United Nations and the League of Nations, there existed no higher international forum than this. In the midst of this terrible war, you, as representatives of the Great Powers of Western Europe and America, have issued a declaration which contained the promise to help us, with your goodwill and support, to establish this national center, for whose realization generations have lived and suffered. In Sokolow’s carefully chosen words, the Balfour Declaration had morphed into the Allied declaration. A monumental effort in many capitals had permitted him to utter that sentence without fear of contradiction. The San Remo conference in April 1920 was an extension of the peace conference. One of its tasks was to parcel out former Ottoman territories into mandates, which the powers would administer as trusts on behalf of the League of Nations. There the powers agreed that Britain would receive the League of Nations mandate for Palestine. But what would it be mandated to do? Would it be charged with facilitating the “national home”? The Balfour Declaration, if introduced into the mandate, would become part of international law. Absent that, there would be no legal standing to the “national home.” Britain, at Zionist urging, sought to have the entire Balfour Declaration inserted in the text of the mandate, and it was here that Sokolow’s 1918 efforts in Paris were richly rewarded. The Balfour Declaration has often been weighed against an earlier set of promises: in 1915 and early 1916, Britain made various pledges to Sharif (later King) Hussein of Mecca, leader of the Arab Revolt, in a series of Arabic letters known as the Hussein-McMahon correspondence. In the letters, the British promised Hussein that they would support Arab independence within certain borders—at the very least in Syria and Mesopotamia, and possibly in Palestine. How was it that the Balfour Declaration became international law, while the Hussein-McMahon correspondence ended up a dead letter? Answer: there was no Arab Sokolow. Once Hussein had his secret pledges from the British, he made little effort to extract comparable commitments from other Allies. In particular, Sykes tried to press Hussein’s son Faisal to act as Sokolow did and come to some understanding with the French over Syria. McMahon had included a key reservation—namely, that the territories promised for Arab independence were only those “in which Great Britain is free to act without detriment to interests of her ally France.” As France’s interests in Syria (and Palestine) were well-known, this should have been a powerful incentive to the Arabs to reach a thorough understanding with the French. But Hussein and Faisal never did, and Faisal came to the peace conference in 1919 without any French chits. Pichon was exaggerating France’s ignorance, but because the Hussein-McMahon correspondence was secret, knowledge of it could be denied. Faisal had entered a collision course with France, which in 1920 occupied Syria by arms and threw him out of Damascus. Given French determination to rule Syria, a clash would have been difficult to avoid, but the absence of an Arab Sokolow in Paris made it inevitable. The Balfour Declaration anticipated what later came to be called public diplomacy. The Zionist movement had no use for secret pledges of the sort Britain gave to the Sharif Hussein of Mecca. The Balfour Declaration thus anticipated what later came to be called public diplomacy. The Zionist movement had no use for secret pledges of the sort Britain gave to Hussein. As Herzl insisted at the First Zionist Congress in 1897, the movement sought “publicly legalized guarantees” since anything less “could be revoked at any time.” Herzl took a dim view of “secret interventions” and called for “free and open discussion subject to constant and complete monitoring by world public opinion.” The aim was to produce a public assurance by any government with control or a say over Palestine, and have it incorporated in public law. In this aspect, Sokolow, a journalist like Herzl, was Herzl’s truest disciple. It was Sokolow who coined the Hebrew term hasbarah (“explanation”), a word that perfectly parallels public diplomacy in its modern sense. Sokolow saw hasbarah as the natural form of Zionist advocacy in the chancelleries of Europe, in editorial boardrooms, and in public speeches. Wilson explicitly asked that his prior approval of the Balfour Declaration not be made public, and it wasn’t. But the Zionists publicized every other assurance. This had the dual purpose of spurring competition among the Allies and raising the morale of rank-and-file Zionists. But above all, an open assurance, communicated to a vast public, could only be retracted at a cost. The British would no doubt have had far fewer qualms about violating a secret pledge made only to the Jews. A public pledge that had been cleared and then seconded by the Allies was another matter. Britain wasn’t yet prepared to sacrifice honor on that scale. How is it that the true nature of the Balfour Declaration has been obscured, so that it is remembered solely as a product of British imperial will? Why does no other government “mark” the centennial? (Apropos, June 4 marked exactly a century to the Cambon letter.) Why has Israel itself failed to remind Washington, Paris, and Rome of their crucial roles, perhaps prompting them to express their own pride in the decisive assurances they gave in 1917? Selective memory is the answer. It is easy enough to understand why the British would prefer to forget that they needed the prior approval of Allies (the French, no less!). Initially, the British wanted the gratitude of the Jews for themselves. Later, when Zionism became a burden, they wanted the exclusive prerogative to downgrade the “national home” in any way they chose, without being second-guessed (by the Americans, of all people!). Even today, Britons ridden by imperial guilt over the Palestinians want the privilege to wallow in it alone. Britain, in this view, has a unique obligation to “set things right”—a remote echo of past imperial hubris. But surely it is incumbent on Israel to remember the Balfour Declaration for what it was: the carefully calibrated consensus of the nascent international community circa 1917. Why has Israel forgotten? Sokolow, too, wrote a polemical History of Zionism in two volumes, published in 1919, designed to convince British readers that the Balfour Declaration capped centuries of the English love of Zion. The possibility that France or Italy or the United States, for a moment’s lack of enthusiasm, might have nipped the whole thing in the bud couldn’t be admitted. But there was a second, pettier reason. Weizmann wanted full credit for the Balfour Declaration. To secure it, he and his associates had to cut out of the story all those parts in which he didn’t star. That included Sokolow’s diplomacy on the continent, which was a solo performance. Weizmann wanted full credit for the Balfour Declaration. To secure it, he and his associates had to cut out of the story all those parts in which he didn’t star. The story of Weizmann and Sokolow, and Weizmann versus Sokolow, could fill a much longer essay and has yet to be told. Suffice it to say that every aspect of Sokolow’s role in 1917 brought the tension between them close to the surface. In his autobiography, Weizmann described Sokolow as lacking “practicality.” “He had no idea of time,” claimed Weizmann, “or the meaning of a practical commitment.” Sokolow also allegedly suffered from an “over-diversification of opinions and convictions,” and “was always in favor of compromise”—a dangerous trait, in Weizmann’s book. Weizmann ended that missive by demanding that Sokolow return to London. For his part, Sokolow dismissed the notion that his mission might encourage French ambitions as “pure imagination.” “Either you have not received my letters,” he wrote to Weizmann, “or you have not had time to go through them.” Sokolow remained on the continent for a full six weeks, working alone and in tandem with Sykes. Full? Not exactly. And this: “We have assurances from the highest Catholic circles that they will view with favor the establishment of a Jewish national home in Palestine.” This was an elastic interpretation of Pope Benedict’s words to Sokolow. In our offices [in London], I found Weizmann and reported to him the results of my effort in Paris. I can’t resist the impression that he is not sincere, and that ambition eats him whole. It seems to me that he increasingly forgoes calm and objective consideration, and instead operates out of personal motives, which arise from his anxiety. He is very suspicious, fears rivals, and brooks no opposition. I showed him the French document. He said, that’s very fine, but I felt he saw it as some sort of competition. were rather jealous that one man from the little [Russian] village of Motol [Weizmann’s birthplace] should have secured the Balfour Declaration. The Polish Jews in particular felt like this since they would have preferred Nahum Sokolow, the father of the Hebrew press, to have been the initiator of the Declaration. To smooth over their ruffled feelings, Schmarya Levin, who was never at a loss for words, told the story of two Jews who were arguing as to which was more important—the sun or the moon. At length they decided that the moon was more important: the sun gives light in the day-time, when it is light out anyhow, whereas the moon gives light when it is dark! Into the 1930s, Sokolow’s disciples still claimed the Balfour Declaration as his achievement. But Sokolow did practically nothing to promote his version. Vain he may have been, but he never got around to writing his memoirs, even of the events leading up to the Balfour Declaration. According to his son, Sokolow made notes and even started filing material, but he died in 1936 without having written anything. The historian Mayir Vereté wrote that “it is not easy to decide whether [Weizmann’s] share was greater than that of Sokolow” in securing the Balfour Declaration. That assertion has been contested by Weizmann’s biographers (although one, Norman Rose, has admitted that Sokolow’s contribution was “often overlooked in the wake of Weizmann’s achievements”). But the question is not whether Sokolow has received less than his due. Until a biographer researches Sokolow as thoroughly as others have researched Weizmann, there cannot be an answer. The problem is that the forgetting of their partnership, perhaps the most consequential in the history of Zionism, didn’t only erase Sokolow from memory; it erased awareness of the Allied antecedents of the Balfour Declaration. The earliest Zionist success in mobilizing international legitimacy became a story of collusion between a wily British Jew and a clutch of British imperialists. For two decades, Weizmann led the Zionist struggle to hold Britain to its promises, to close what he recognized as “the gap between the promise of the [Balfour] declaration and the performance.” But by the late 1930s, Britain was in full retreat from the declaration; in the British White paper of 1939, Zionists saw its final abrogation. The White Paper, which informed British policy throughout World War II, blocked Jewish immigration to Palestine at precisely the moment when the Jews of Europe faced destruction. Britain attempted to set Palestine on a course to become an Arab state with a Jewish minority. As the sun set on Britain’s support for Zionism, Weizmann argued that Britain hadn’t the right to discard or even interpret the Balfour Declaration on its own. Why? Not because its text had appeared in the preamble of the League of Nations mandate. By 1939, the League was in tatters. Instead, Weizmann cited the World War I commitments made to Zionism by the other Allies. Britain had the “moral right” to rule Palestine only because the “civilized nations of the world” had conferred it “for the explicit and direct purpose of helping to build up the Jewish National Home.” And these nations did so because of Zionist exertions. Did not the British government of the time—1917-18—encourage us, the late lamented leader Sokolow, myself, and other friends who were working in the cause of Great Britain and Palestine, to go to France, Italy, America, and plead—I do not exaggerate this contribution—that the mandate should be given to Great Britain? We were encouraged to do it. We were encouraged to bring in our people. We were encouraged to pour out all that was best in us because we trusted in the word of Britain; that was for us the rock on which we were to build in Palestine. The Balfour Declaration did not legitimate Zionism. It was Zionism, through its diplomatic efforts, that legitimated the Balfour Declaration. Thus did Weizmann, at his lowest ebb, admit the true character of the Balfour Declaration. It had not legitimated Zionism. It was Zionism, through its diplomatic efforts among “civilized nations,” which had legitimated the Balfour Declaration. Not only had its issuance depended on the tacit or explicit agreement of the Allied powers, but that agreement had been secured by the Zionists themselves—by Weizmann, Brandeis, and, above all, by the lamented but forgotten Sokolow. The centennial of the Balfour Declaration is the perfect opportunity to chip away at the distorted accretions of a century. The largest of these is the notion that the Balfour Declaration arose outside any legitimate framework, as the initiative of a self-dealing imperial power. This is utterly false. The Balfour Declaration wasn’t the isolated act of one nation. It was approved in advance by the Allied powers whose consensus then constituted the only source of international legitimacy. Before Balfour signed his declaration, leaders and statesmen of other democratic nations signed their names on similar letters and assurances. The Balfour Declaration anticipated a world regulated by a consortium of principal powers—the same world that, 30 years later, would pass a UN resolution legitimating the establishment of a Jewish state. This centennial is thus the time to remind governments of their shared responsibility for Britain’s pledge to establish a Jewish “national home” in Palestine. In Washington, Paris, Rome, and Vatican City, it is important for Israel’s ambassadors and friends to speak openly of the historic and essential role of each government in the gestation of the declaration. The same should be done in all of the capitals that endorsed the Balfour Declaration after its issuance, but before it was enshrined in the mandate. That would include Beijing and Tokyo. The American role deserves particular emphasis. Few Americans know that Wilson approved the Balfour Declaration in advance, or that this approval had a decisive effect in the British cabinet. The United States never entered the League of Nations, and so never ratified the mandate. But in June 1922 the United States Congress passed a joint resolution (the so-called Lodge-Fish resolution) that reproduced the exact text of the Balfour Declaration (“the United States of America favors the establishment in Palestine,” etc.). President Warren G. Harding signed the resolution the following September. The centennial is a unique opportunity to remind the American public of these facts, all of which point to America’s shared responsibility for the Balfour Declaration. We are proud of our role in creating the state of Israel. . . . Establishing a homeland for the Jewish people in the land to which they had such strong historical and religious ties was the right and moral thing to do, particularly against the background of centuries of persecution. Proud Britain may be, but Israel cannot forget that in May 1939 the British unilaterally abrogated the Balfour Declaration, shutting down Jewish immigration to Palestine. This act had no legal foundation. The Permanent Mandates Commission of the League of Nations concluded that the White Paper “was not in accordance with the interpretation which, in agreement with the mandatory power and the Council, the commission had always placed upon the Palestine mandate.” Not only did Britain freely reinterpret the “national home” so as to preclude a state, but Britain even denied that it meant a haven. So Britain barred Europe’s Jews from entry to their legally recognized “national home,” and Jews perished in the millions. If the 1917 Balfour Declaration is now to be deemed a source of British pride, its 1939 abrogation should be deemed a source of British shame. The subject of Britain and Europe’s Jews during the Holocaust has been researched thoroughly. “Within the [Holocaust’s] greater circle of tragedy,” wrote one historian, “there was a smaller one”: namely, Britain’s determination to keep desperate Jewish refugees out of Palestine by every possible means. This must not be forgotten when Israel’s prime minister arrives in London to “mark” the centenary of the Balfour Declaration. Yes, this will be a chance to strengthen bilateral relations. No, an apology is not demanded. But if the Balfour Declaration is now to be deemed a source of British pride, its revocation should be deemed a source of British shame. And what of the other claim, that the Balfour Declaration disregarded the Palestinian Arabs? Balfour was not ignorant of objections to Zionism. Its critics, he said in a 1920 speech, invoked the principle of self-determination, claiming that if applied “logically and honestly, it is to the majority of the existing population of Palestine that the future destinies of Palestine should be committed.” Balfour thought there was a “technical ingenuity” to this claim. But, looking back upon the history of the world, upon the history more particularly of all the most civilized portions of the world, I say that the case of Jewry in all countries is absolutely exceptional, falls outside all the ordinary rules and maxims, cannot be contained in a formula or explained in a sentence. The deep, underlying principle of self-determination points to a Zionist policy, however little in its strict technical interpretation it may seem to favor it. This should be read as the codicil to the Balfour Declaration. The Cambon letter spoke of “justice” and “reparation,” Pope Benedict cited “providence,” the mandate preamble mentioned “the historical connection of the Jewish people with Palestine.” These were all attempts to contain, in a formula, that which Balfour said no formula could contain. The poetic simplicity of the Balfour Declaration resides in its presumption that a home for the Jews in their land needs no justification. “How goodly are thy tents,” the declaration proclaims. A century later, it still does. IN THIS article the author relates what he believes to be the true story of how the British government came to issue what has come to be known as the Balfour Declaration. I have written three earlier articles in the Washington Report on Middle East Affairs, on this subject, and my views have evolved with the passage of time.1,2,3 What has not changed is my belief in a British-Zionist trade whereby the Zionists assisted in bringing America into the war and, in return, the British promised them Palestine. Among the things that have changed is my concept of the timing of the agreement. The earliest article contained a chronology showing that the British received a plain-language copy of the Zimmermann telegram (ZT) a few days after it was sent, encoded, from Berlin to Washington, on Jan. 16, 1917, and that the first formal meeting between British Zionists and the British government took place on Feb. 7, 1917. It now appears that the basic agreement was made several months before that time and what was betrayed to the British was not the text of the ZT, but rather the code in which it was sent. The story can begin about halfway through the First World War, in the autumn of 1916. We will examine three components of the situation at that time: the military and naval positions and the status of British Zionist negotiations. On land, the war began in August 1914 with the German army facing enemies on two fronts. In accordance with a long-standing plan, the Schlieffen plan, Germany attacked France first, hoping for a quick victory there, after which it could turn its full attention to the Russian front. Events did not work out that way. The Germans did advance, through Belgium, deep into France, but they did not succeed in enveloping Paris from the west, as had been the intention. By the end of 1914 a sort of stalemate had developed. A year and a half later the location of the front had not changed greatly, and a continuous line of trenches ran from the Swiss border almost to the North Sea. Both sides mounted offensives from time to time, with heavy loss of life, but the location of the front changed by only a few miles. The Germans fared better on the Russian front, but that does not concern us here. By the middle of 1916 the French army was largely exhausted, and the next big Allied offensive was undertaken primarily by the British. The battle of the Somme began on July 1, 1916 and was one of the bloodiest in history. The British suffered 60,000 casualties (19,000 dead) on the first day alone. Total casualties were over a million, more or less equally divided between the two sides. The location of the front shifted by a few miles. Well before the battle ended, the British must have concluded that they would not be able to drive the Germans out of France by frontal assault. On Feb. 4, 1915 the German ambassador informed the American government that from Feb.18 a counter blockade would be in force, and the territorial waters of Great Britain and Ireland, including the whole of the English Channel, were declared a war area. On May 7, 1915 the British liner Lusitania, traveling from New York to Liverpool, was struck off the Irish coast by a single torpedo, which provoked a much larger secondary explosion. The ship sank quickly, with the loss of almost 1,200 lives, 128 of them American. There was strong American reaction to the sinking of the Lusitania, both popular and diplomatic, and the U.S. came close to breaking off diplomatic relations with Germany. A meeting between the German ambassador and President Woodrow Wilson on June 2 had the effect of calming matters for a time, but an exchange of diplomatic notes occurred. The second American note, of June 10, led to the resignation of the American secretary of state, William Jennings Bryan, who believed that neutrality required that American citizens be forbidden from traveling on ships bearing the flag of any belligerent nation. And, in fact, Americans could perfectly well have traveled on American, Dutch, or Scandinavian vessels. Although there had been no settlement of the Lusitania case, feeling died down for a time. Then on Aug. 19, 1915 the British passenger steamer Arabic was sunk off the coast of Ireland, with the loss of two American lives. Once again the possibility of war between the U.S. and Germany loomed. In this case, however, Germany revealed that, following the Lusitania sinking, German submarine commanders had been ordered not to sink liners without warning, and apologized and offered compensation. Although the Lusitania matter still was not settled, following the Arabic apology German-American relations remained tranquil for several months. The next cloud on the horizon was the “Sussex incident.”� On March 24, 1916 the French trans-channel steamer Sussex was reported torpedoed and sunk in the English Channel, with the loss of several American lives. There seems to be some question as to whether the Sussex was in fact torpedoed and sunk at all, but in any case, the American government issued an ultimatum, and the German government was forced to acknowledge that the Sussex had been sunk by a German submarine and to agree that henceforth German submarines would abide by the rules of “cruiser warfare,”� a severe restriction which seriously handicapped the submarine as a strategic weapon. Throughout the war, there were two schools of thought within the German government. One held that the submarine was a major strategic weapon, with the potential of winning the war for Germany. The other held that the continued use of submarines against merchant shipping would lead to continual incidents and ultimately bring America into the war on the side of the Allies, and that therefore the use of submarines against merchant shipping was against Germany’s interest. By the fall of 1916 this issue had not been resolved. British-Zionist negotiations date back at least to 1903. In that year the sixth Zionist congress took place in Basel. It is referred to as the “Uganda”� congress because it dealt with an offer by the British government to make available land in Uganda for Jewish settlement. The offer was seriously considered and was, in fact, approved by a majority of the delegates, but the debate proved to be very divisive, and ultimately the offer was not taken up. During that period Arthur Balfour was British prime minister, and the Zionists had retained the London law firm of Lloyd George, Roberts and Co. This firm was chosen because one of the partners, David Lloyd George, was an MP and thus in touch with Foreign Office thinking.5 Both Balfour and Lloyd George must have given serious thought at that time to the question of what the British government and the Zionists could do for each other. British-Zionist negotiations date back at least to l903. In any case, it would seem that a pattern of British-Zionist negotiations, and in particular of Balfour-Weizmann negotiations, had been established well before the fall of 1916. Whatever the truth of the timing may be, Weizmann established a pattern of frequent visits to the admiralty, ostensibly in connection with his chemical process, but which would also have provided the opportunity for frequent, prolonged and secret negotiations between Weizmann and Balfour. Once it became clear, in the fall of 1916, that the battle of the Somme would not result in the German army’s being forced out of France, the British, with their resources approaching exhaustion, had to consider what to do next. Herbert Asquith, who had been prime minister since 1908, had begun, reluctantly, to consider a negotiated peace, but negotiations with the Zionists, through Weizmann and Balfour, provided another option for Britain, although not for Asquith. That option was the possibility of a formal, but secret, alliance between the Zionists and the Monarchy, whereby the British Monarchy would undertake to facilitate the establishment of a Jewish state in Palestine and the Zionists would undertake to help bring America into the war on the side of the Allies, thus assuring an Al-lied victory. An agreement with a British government would certainly be necessary, but British governments come and go, and a commitment from something less ephemeral than a British government would have been required by the Zionists. It is proposed that such a secret agreement took place. There seems to be no way to date it accurately, but it seems likely to have occurred sometime in October 1916. Once a formal agreement was in place, the next step was to arrange for several changes in personnel—on both the British and the German sides. The first change was in the leadership of Room 40, the name given the British codebreaking organization. Room 40 was destined to play a key role in the vast deception to follow, and it was necessary to have a trusted actor at its head. Room 40 was first set up in the fall of 1914 under the direction of Alfred Ewing, who retained that position until October 1916. At that time Ewing was replaced by Captain Reginald Hall, director of naval intelligence. Balfour found a suitable position for Ewing in academia. See “Five Books,”� p. 47. Von Jagow was replaced by Arthur Zimmermann, undersecretary for foreign affairs since 1911. Before 1914, Berlin was the center of Zionist activity, and in 1912 the organization which was to become the Technion, or Israel Institute of Technology, in Haifa had placed itself under the protection of Germany, and Zimmermann had arranged with the Turkish government for the purchase of land and the erection of a building.9 Zimmermann clearly enjoyed good relations with German Zionists and was thus susceptible to Zionist influence. In November 1916, Woodrow Wilson was re-elected to a second term as U.S. president with the slogan, “He kept us out of war.”� It was understood that Wilson’s aim was to bring about a negotiated end to the war without victory for either side. Lloyd George then quickly imposed a war dictatorship, and direction of the war was entrusted to a “War Cabinet”� of five members, including himself as prime minister and Balfour as foreign minister. Mark Sykes was named secretary. At that point, all necessary changes in personnel had been accomplished. On Dec. 18, 1916, the American ambassador to Britain conveyed an “offer of peace”� on behalf of the Central Powers to the Allies. On the following day, David Lloyd George, in his first speech to Parliament as prime minister, heaped scorn on the peace proposal and vowed that Britain and its allies would fight on until victory. In retrospect, it seems clear that this speech was a bluff and was meant to goad the Germans into resuming unrestricted submarine warfare. That this was indeed the case is indicated by a series of messages from the U.S. ambassador to Britain, Walter Page, to President Wilson and the secretary of state, written in June 1917.11 These messages make it clear that Britain was on the verge of financial collapse, and that only American support could avert disaster.”� These messages were made public only in 1925 and are, in my opinion, too little known. On Jan. 9, 1917 the German government made the fateful decision to resume unrestricted submarine warfare at the beginning of the following month. Date unknown—What would come to be known as the Zimmermann telegram was concocted in London. My source for this information is a letter to the Washington Report on Middle East Affairs, written in response to my first (1997) article, by author Russell Warren Howe.12 Howe stated that he had been taught at Cambridge that the ZT was “concocted in London to encourage Washington to join the Allies against the Central Powers.”� My first reaction to this letter was doubt—because Zimmermann subsequently accepted responsibility for the ZT. But of course he had to, because he was responsible, even if the idea came from someone else. Date unknown—One Herr von Kemnitz, an East Asia expert in the German foreign office and presumably a Zionist agent, presented Zimmermann with the text of a proposed telegram, the ZT, that he had supposedly drafted but had more likely received from London.13 Against the opposition of some of his colleagues, he persuaded Foreign Minister Zimmermann to send it. On Jan. 16, 1917, two telegrams were sent sequentially, by cable, from Foreign Minister Zimmermann, in Berlin, to the German ambassador in Washington, Count Bernstorff. The first, which both Zimmermann and Bernstorff considered to be by far the more important, informed Bernstorff of the decision to resume unrestricted submarine warfare on Feb. 1, 1917, and gave him instructions on when and how to inform the American government. The second was what has come to be known as the Zimmermann telegram. (See box on facing page.) This second telegram was relayed to the German Embassy in Mexico City on Jan. 19, 1917. The British intercepted the ZT on the day it was sent and promptly decoded it. It should be noted that Zimmermann sent the ZT on his own authority. Neither the Kaiser nor Chancellor Bethmann-Hollweg knew anything of it until it was made public in America. After seeing these cables, Bernstorff attempted to have the German government rescind the unrestricted submarine warfare decision, but was unsuccessful. Jan. 31, 1917—Bernstorff informed the U.S. government that unrestricted submarine warfare would commence the following day. Feb. 3, 1917—The U.S. broke off diplomatic relations with Germany, and Bernstorff was told to leave the U.S.
Feb. 7, 1917—The secretary of the War Cabinet, Mark Sykes, met with Weizmann and other Zionist leaders in London, in what is widely, but incorrectly, believed to have been the first contact between the British government and the Zionists during the war. It is doubtful that Sykes himself had any knowledge of the October 1916 British-Zionist agreement. Feb. 14, 1917—Bernstorff left New York on the Danish steamer Friedrich VIII to return to Germany. Safe conduct had been granted by the British. Feb. 16, 1917—The Friedrich VIII entered Halifax, Nova Scotia harbor. Bernstorff remained incommunicado for almost two weeks. Feb. 26, 1917—The State Department received a telegram from the American ambassador in London containing the plain language text of the ZT. Feb. 27, 1917—Friedrich VIII permitted to sail from Halifax. March 1, 1917 —Text of ZT published in U.S.
March 15, 1917—Czar Nicholas II abdicated, following the first of two 1917 revolutions in Russia. A provisional government was formed, later headed by Alexander Kerensky. Democracy appeared to have taken hold in Russia. April 2, 1917—President Wilson addressed Congress. He spoke of the “wonderful and heartening”� events in Russia, stated that “the world needs to be made safe for democracy,”� and asked Congress to declare war on Germany. April 6, 1917—Congress declared war on Germany. Aug. 6, 1917—Zimmermann replaced as foreign minister in Germany. Early November 1917—The Bolshevik revolution took place in Russia. The promise of democracy disappeared. The ex-Czar and his family were subsequently put to death. Kerensky was removed from power but came to no harm. Nov. 2, 1917—Arthur Balfour sent a letter, including what has come to be known as the Balfour Declaration (BD), to Lord Walter Rothschild. For a number of years it was not known that the BD took this form. Lord Balfour’s obituary in The New York Times of March 20,1930 stated that the BD was the text of a speech delivered by Balfour on Nov. 4, 1917. See box p. 44. March 8, 1918—Weizmann had a private and secret audience with King George V. According to Weizmann’s account in Trial and Error, the meeting consisted of an exchange of pleasantries, and one must wonder whether the meeting did not have some unstated purpose. One wonders, for example, if Weizmann did not emerge from the meeting in possession of a document signed by the King of England, possibly committing to more than did the BD. Nov. 11, 1918-World War I ended. To establish that German Code 7500 was obtained by the British in 1917 by means other than codebreaking, it is instructive briefly to review five publications. These will be examined in the order in which they were published, which—because book three was first published classified and later declassified—is different from the order in which they were made public. Our first book is The Life and Letters of Walter H. Page by Burton J. Hendrick.14 Walter Page was a long-time (since 1881) friend of President Woodrow Wilson and was appointed by him to be U.S. ambassador to Great Britain, serving from 1913 until his death in 1918. Volumes I and II of this three-volume work have a common index and were both published in 1922. Volume III deals largely with Page’s correspondence with President Wilson and Secretary of State Robert Lansing and was published in 1925, after Wilson’s death. It is important to remember that these volumes were written not by Page himself, who died in 1918—less than two months after the end of World War I—but by his biographer, Hendrick, who assembled the letters from many sources. We are concerned here only with Volume III. Hendrick relates that in late February 1917 Balfour personally handed Page a copy of the document which has come to be known as the Zimmermann telegram. This document can be found in the box at right, and is referred to there as ZT-2. It is the version of the telegram that was forwarded by the German Embassy in Washington to the German Embassy in Mexico City on Jan. 19, 1917. Balfour stated that the telegram had not been obtained in Washington but had been bought in Mexico City. Two other versions of the Zimmermann telegram may also be found in the box at right. These are ZT-1, the original telegram as cabled from Berlin to Washington on Jan. 16, 1917, and what we may call ZT-Hendrick. ZT-Hendrick appears nowhere else than in Hendrick’s book. It seems to be something the British gave Page, with an indication that it was an early, partial, decipherment of ZT-2 made sometime before Page was given the completely deciphered version. It is evident, however, that ZT-Hendrick is derived from ZT-1, not ZT-2. ZT-1 and ZT-2 are, of course, English translations of German originals. There is no German original of ZT-H. Some people in the U.S. government must have learned in early 1917 that ZT-1 and ZT-2 were sent encrypted in two different and unrelated codes. This did not become public knowledge, however, until F&M (see Book 3, below) was declassified in 1965. It is difficult to see how the national interest was served by hiding from public knowledge for 48 years the simple fact that ZT-1 and ZT-2 were encrypted in different codes. It was fortunate for the British that Page died when he did in 1918. Page was clearly an anglophile and eagerly accepted everything Balfour told him. Nevertheless, had he learned that the two versions of the ZT had been sent in different codes and that ZT-Hendrick could only have been derived from ZT-1, he would surely have realized that he had been deceived. The second book is Arthur James Balfour by Lord Balfour’s niece, Blanche Dugdale, published in two volumes in 1936 (London) and 1937 (NY).15 This is a lengthy work, covering Lord Balfour’s entire life and political career. We are concerned here only with Chapter 10 of the second volume, in which the following significant paragraphs appear. The year referred to is 1917. The method by which this information had reached the British Intelligence Service made it impossible for some time to communicate it to the United States Government. Therefore for over a month Balfour read his dispatches from Washington of the slow wakening of the American will to war, but could do nothing to hasten the process. Till—at last—information about the Mexican plot reached London through channels which enabled the Intelligence Service to cover up the traces of how it had first been got. This appears to open the possibility that the British government obtained either the Zimmermann telegram or the code in which it was sent from an informant, rather than by code-breaking, and in any case indicates that the British possessed the full text of ZT-1 shortly after it was sent. The third work to be examined is a U.S. Army Signal Corps Bulletin, The Zimmermann Telegram of January 16, 1917 and its Cryptographic Background, by William F. Friedman and Charles J. Mendelsohn (F&M).16 This work was published, classified, in 1937 and was declassified in 1965. The senior author was born Wolfe Friedmann in Kishinev, Russia in 1891 and ultimately became known as the Father of American Cryptanalysis. Friedman and Mendelsohn (F&M) undertake to determine how the British were able to intercept the Zimmermann telegram and how they were able to decipher it. They reveal that the ZT (ZT-1) was first transmitted by submarine cable from Berlin to the German ambassador in Washington, Count Bernstorff, on Jan. 16, 1917, encrypted in German code 7500, and that Bernstorff then relayed it (ZT-2) as a Western Union telegram encrypted in German code 13042, to the German legation in Mexico City on Jan. 19. Two different codes were used because the German legation in Mexico did not possess code 7500, and the ZT had to be relayed to them in an older and less secure code. Code 7500 was a new and difficult code, only recently delivered by submarine to the U.S., and it is the professional judgment of F&M that the British would have been able to make, at best, a very rudimentary decipherment of the ZT by the time they made the verbatim text of the ZT available to the U.S.
F&M’s explanation of how the British obtained the text of the ZT is that, after making a meager beginning in deciphering the 7500 version, they were able to obtain a copy of the 13042 version, after which decipherment was soon accomplished. This fails to explain, however, how the British were able to obtain the text of the preamble of the 7500 version of the ZT, which they did. The more likely explanation of how the British were able to obtain a verbatim copy of the original 7500 version of the ZT is that, at the time the ZT was sent, the British already possessed the key to that code. Although F&M reproduce the Dugdale quotation given above, they are remiss in having failed even to consider the obvious possibility that the British might have obtained the text of ZT-1 (or code 7500) through an informant rather than by code-breaking. The possibility must be considered that this failure was by design rather than through oversight. The fourth book to be considered is The Zimmermann Telegram, by Barbara Tuchman.17 This work first appeared in 1958, and a second edition appeared in 1966, i.e., after F&M was declassified in 1965. The first edition of Tuchman’s book states that the British picked up the encoded ZT by wireless on Jan. 16, 1917, and found it to be in code 13042, which was related to codes the British already had deciphered. They were thus able, in short order, to produce a nearly complete copy of the decoded ZT. In fact, the ZT was transmitted by cable, not radio, and encrypted in code 7500, not 13042. Normally, the second edition of a book provides an opportunity, and also the duty, for the author to correct errors in the first edition. That did not happen with this book. The text is unchanged, but a “Preface to New Edition”� has been added. In it, Tuchman reports the declassification of F&M and acknowledges that it “appears to modify my account”�—a gross understatement. She acknowledges having been aware of the existence of F&M and acknowledges having been in contact with Friedman but professes to have been unaware of the content of the book. The heart of Tuchman’s book is the de-tailed story in Chapter 1 of how the British deciphered the ZT in code 13042 on Jan. 16, 1917. A reading of F&M makes it clear that this story is false. It is conceivable that Tuchman believed this story when she first wrote it, but it is not possible that she still believed it when the second edition of her book was issued. It is the belief of this writer that Tuchman fabricated a false story of how the British obtained the text of the ZT in order to conceal the fact that they obtained it by betrayal rather than by codebreaking. It is remarkable that Tuchman’s book continues to be read and believed more than 30 years after hard evidence has become available that the story is false. The fifth and final book on our list is The Codebreakers, by David Kahn, published in 1967.18 This a lengthy work of 26 chapters and over 1,000 pages. We are interested primarily in Chapter 9, entitled “Room 40.”� About half of that chapter is devoted to the ZT. A second edition appeared in 1996, but it does not alter Chapter 9. Kahn’s explanation of how the British were able to decipher the ZT in code 7500 (which, like Tuchman but unlike F&M, he calls 0075) is that “somehow”� the British obtained enough material in code 7500 to make a start at breaking it. Kahn quotes an incomplete version of the ZT as being what the British were able to produce. This same incomplete version is referred to by F&M as the “Hendrick version,”� of which they say: “When all is said and done, the decipherment of the 7500 version of the Zimmermann telegram, even to the degree given in the Hendrick version, approaches the unbelievable.”� Note that, unlike Kahn, who is a writer on cryptography, F&M were professional cryptographers. One’s confidence in Kahn is eroded by the fact that, in discussing the question of why, after the ZT was made public, Zimmermann admitted authorship of it, Kahn states, “to this day no one knows why Zimmermann admitted it”� (p. 297). This is disingenuous. Anyone who has looked into the matter knows exactly why he admitted it. The Germans were as much taken by surprise by the publication of the ZT as anyone else and wanted to know if it was genuine. Zimmermann was called on to testify before the Reichstag and had no choice but to admit it. As an aside, note that Room 40 was the name given to the cryptoanalytic bureau set up in the British admiralty early in the war under the direction of Sir Alfred Ewing. Kahn reveals that Ewing remained the head of Room 40 from the fall of 1914 until October 1916, when he returned to academia, whence he had come. His departure was facilitated by Lord Balfour, and his replacement was Captain Reginald Hall, R.N., director of naval intelligence. We may infer that at this time British-Zionist negotiations were well under way and that Room 40’s role was being broadened from cracking German codes to include pretending to crack German code 7500. We have examined our five books one-by-one. Let us now relate them to each other. It is the unproven belief of the present writer that German code 7500, in which the original ZT was sent in January 1917, was obtained by a Zionist agent inside the German government, possibly either by means of photography or a photographic memory, and provided to the British government. The second book cited, by Blanche Dugdale, is consistent with this belief in that it contains a veiled hint that the British might have obtained the plain language text of the ZT by means other than codebreaking, whereas the three following books totally ignore this possibility. Interestingly, the other three books give different, and incompatible, stories of how the British did obtain the text of the ZT. It is clear that the authors of books three, four and five were acquainted with each other. Since it was the first of these three books, F&M, of course, make no mention of Tuchman or Kahn. In her “Preface to New Edition,”� written after the declassification of F&M, Tuchman acknowledges having known of the existence of F&M, though not its content, and having spoken to Friedman. (There was no mention of either of these facts in the first edition.) Also in the same preface, Tuchman states that decipherment of code 7500 (which she calls 0075) will be analyzed in Kahn’s, at that time forthcoming, book. This implies contact between them. Interestingly, Kahn makes no mention of Tuchman, nor does her name appear in the index, although Kahn’s account of the historical circumstance of the ZT seems to be largely borrowed from her book. Kahn does, however, mention Friedman. In the preface to The Codebreakers. Kahn mysteriously thanks Friedman for “a gift made in 1947, upon my graduation from high school, that was a major step in my cryptographic education.”� One wonders if that “gift”� might not have been the secret of how the British first obtained German code 7500 and of the need to protect that secret in perpetuity. In his seminal work, Arab Awakening (1938), George Antonius points out that in early 1917 three major obstacles stood in the way of Zionist efforts to obtain a commitment from the British government in support of their goals in Palestine.19 First was the bargain concluded in 1915 with Sharif Husain of Arabia for an independent Arab state whose territory included Pales-tine. Second was the Sykes-Picot agreement, dividing the Middle East between Britain and France and placing the Holy Land under some sort of international administration. And third was the hostility toward political Zionism of an influential group of British Jews. The initial meeting between Sykes and the Zionists took place on Feb. 7, 1917, and we can now see why the “services rendered”� toward bringing America into the war have hitherto escaped the scrutiny of all the historians of America’s intervention. One would expect that Zionist actions aimed at bringing America into the war would have taken place sometime after the first British-Zionist meeting, but the first acknowledged contact between the British Government and Zionists was the Sykes meeting of Feb. 7, 1917. Yet by that time the Zionist contributions toward bringing America into the war already had largely been accomplished, although it is likely that Sykes himself was unaware of that. The Balfour-Weizmann agreement of October 1916 was and remains entirely secret. The Sykes meeting served as a sort of decoy. The civilian head of codebreaking “Room 40”� in London had been replaced by the director of Naval Intelligence. Von Jagow, who had served since 1913, was replaced by Zimmermann as German foreign secretary. Asquith, who had served as British prime minister since 1908, was removed from power, and a new War Cabinet was formed, in which Lloyd George was prime minister and Balfour foreign minister—both friends of Zionism since 1903. The key to German code 7500 was betrayed to Room 40. A draft of the ZT was concocted in London and presented to Zimmermann by one of his subordinates in Berlin. The ZT was transmitted by cable from Berlin to Washington on Jan. 16, 1917. It was copied by Room 40 and promptly de-coded. Note that this is incompatible with Tuchman’s story but entirely consistent with Dugdale’s account. Thus, by the time of the Sykes-Zionist meeting of Feb. 7, 1917, the Zionist part of the bargain had been accomplished, and America was as good as at war. All that remained was for the British to find the best time and method for revealing the contents of the ZT to President Wilson and for him to convince Congress and the American people to go to war. Cornelius, John. “The Balfour Declaration and the Zimmermann Note,”� The Washington Report on Middle East Affairs (Washington Report on Middle East Affairs), Aug./Sept. 1997. Cornelius, John. “Answering Critics of the Theory that Balfour Declaration Was Payoff for Zionist Services in WWI,”� Washington Report on Middle East Affairs, Sept. 1998. Cornelius, John. “Palestine, the Balfour Declaration, and Why America Entered the Great War,”� Washington Report on Middle East Affairs, Oct./Nov. 1999. Bernstorff, Count Johann Heinrich. My Three Years in America, New York: Scribner’s, 1920. Dugdale, Mrs. Edgar. The Balfour Declaration-Origins and Background, London: The Jewish Agency for Palestine, 1940, pp. 15-16. Weizmann, Chaim. Trial and Error, Westport, CT: Greenwood Press, 1949, p. 152. Rothschild, Miriam. Dear Lord Rothschild, Glenside, Pa.: Balaban Publishers, 1983, p. 341. Dugdale, Blanche. Arthur James Balfour, NY, Putnam’s, 1937, Vol. II, pp. 127-9. Hendrick, Burton J. The Life and Letters of Walter H. Page, NY, Doubleday, Page & Co., 1925, Vol. III, Chap 14. Howe, Russell Warren. Washington Report on Middle East Affairs, Letters to the Editor, Jan./Feb. 1998, p. 110. Link, Arthur S., Wilson, Vol. 5, Princeton, NJ, 1965, Princeton University Press, pp 433-5. Dugdale, Arthur James Balfour, Vol. II. Friedman, William F. and Mendelsohn, Charles J. The Zimmermann Telegram of January 16, 1917 and its Cryptographic Background, Laguna Hills, CA: Aegean Park Press, 1994. Tuchman, Barbara W. The Zimmermann Telegram. New York: Ballantine Books, 1958, 1966. Antonius, George. The Arab Awakening. Philadelphia, NY: Lippencott, 1939. It is our purpose on the 1st of February to commence the unrestricted U-boat war. The attempt will be made to keep America neutral in spite of it all. In case we should not be successful in this, we propose Mexico an alliance upon the following terms: Joint conduct of war. Joint conclusion of peace. Ample financial support and an agreement on our part that Mexico shall gain back by conquest the territory lost by her at a prior period in Texas, New Mexico, and Arizona. Arrangement as to detail is entrusted to your Excellency. Your Excellency will make the above known to the President in strict confidence at the moment that war breaks out with the United States, and you will add the suggestion that Japan be requested to take part at once and that he simultaneously mediate between ourselves and Japan. Please inform the President that the unrestricted use of our U-boats now offers the prospect of forcing England to sue for peace in the course of a few months. Zimmermann to Bernstorff for Eckhardt W. 158. Most secret for your Excellency’s personal information and to be handed on to the Imperial Minister in ? Mexico with Tel. No. 1...by a safe route. Your Excellency should for the present inform the President secretly (that we expect) war with the U.S.A. (possibly) (...Japan) and at the same time to negotiate between us and Japan...(indecipherable sentence meaning please tell the President) that...our submarines...will compel England to peace in a few months. A little known historical incident took place in the spring of 1917, shortly after the U.S. entered World War I on the side of the Allies. President Woodrow Wilson devised a plan for bringing about an early end to the war by detaching Turkey from the Central Powers. To this end, he sent a mission to Europe, where it was to meet with representatives of Britain and France in Switzerland and then make its way to Turkey. The mission was headed by Henry Morgenthau, Sr., who had been American ambassador to Turkey from 1912 to 1915 and had many contacts there. This story is related in Chapter 17 of Chaim Weizmann’s 1949 autobiography, Trial and Error. The American mission never arrived in Switzerland, let alone Turkey. In early June of 1917, Weizmann, who was then in London, received a cable from Louis Brandeis in the U.S., informing him of the mission and suggesting that he contact it. Weizmann immediately contacted members of the British government and learned the nature of the mission. Weizmann was concerned that the Morgenthau mission might result in the war ending with the Ottoman Empire still intact, eliminating the possibility of a Jewish state in Palestine. A subsequent conference with Lord Balfour lead to Weizmann’s being sent as the official British representative to meet with the American mission and a French representative. This meeting took place at Gibraltar after the American mission disembarked at Cadiz on July 4, 1917. Weizmann reports that he had no difficulty persuading Morgenthau to drop the whole matter, so instead of proceeding to Switzerland and Istanbul, Morgenthau went to Biarritz, in the South of France, where, he said, he would communicate with General Pershing and await further instructions from President Wilson. The Morgenthau mission was apparently secret, for Weizmann says he does not know how the story got out. He also says that in 1922, when Congress was looking into the merits of a Jewish homeland in Palestine, a senator stated that the leaders of the Zionist movement were unworthy men and that Weizmann, in particular, had prolonged the war for two years by scuttling the Morgenthau mission. Morgenthau seems to have shown more loyalty to Zionism than to his president or his country. British Prime Minister Theresa May has announced that Britain will celebrate the 100the anniversary of the Balfour Declaration later this year. The Conservative Party leader addressed her party's "Friends of Israel" faction and declared that the Balfour Declaration was "one of the most important letters in history" while pledging that her government would celebrate it "with pride." Her determination to do so is a clear indication that those who control national politics also control official interpretations of history. In the case of the Balfour Declaration's centenary, it is the ongoing alliance of Zionist special interests and British political power that is about to turn what has been a disaster for Britons, Jews and Palestinians alike, into a source of national pride. The Balfour Declaration may be the most extraordinary document produced by any government in world history. It took the form of a letter from the government of His Britannic Majesty King George the Fifth, the Government of the largest empire the world has even known, on which -- once upon a time -- the sun never set; a letter to an international financier of the banking house of Rothschild who had been made a peer of the realm ... Malcolm's belief in the Balfour Declaration as a means of bringing the United States into the war was confirmed by Samuel Landman, secretary to the Zionist leaders Weizmann and Sokolow, and later secretary of the World Zionist Organization. ... The Balfour Declaration provides solid evidence that the dominance of Jewish political lobbies in world affairs is not really a 'new development.' ... In his invaluable book, The Pity of it All, Israeli historian Amos Elon suggests that the 1917 Balfour Declaration was at least partially motivated by the British government's desire to win the support of pro-German American Jews so that they would help to pull the USA into the war ... Elon's conclusion is clear. "The 1917 Balfour Declaration, calling for the establishment of a Jewish national home in Palestine, was at least partly motivated by the British government's desire to win support among pro-German American Jews."